The Patriot II is a smaller version of the Patriot for those with limited space for their firearm storage needs. This one-of-a-kind gun cabinet can securely store and conceal up to 5 rifles with a maximum gun length of 44.5". The outer frame of the bookcase easily glides forward to reveal the pull-out gun rack hidden behind the bookcase shelves. This design ensures that there are no seams or gaps to reveal the existence of this secret compartment. Perfect for any gun collector that doesn't want to leave their rifles out on display to potentially be stolen, this unique design still provides quick & easy access to your rifles in the event that you need them to protect your family. A secure lock also comes standard with this bookcase and is positioned behind the top molding and out of sight. this lock will keep the frame from sliding forward to reveal the gun rack. 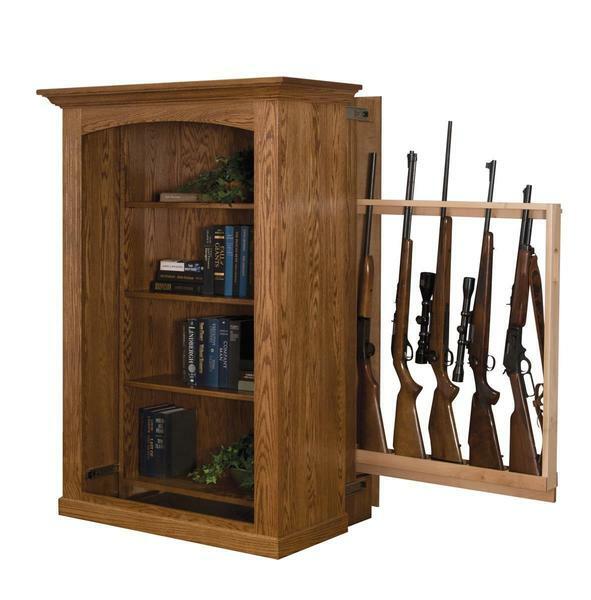 For additional information or custom ordering assistance on this unique bookcase gun cabinet, contact one of our knowledgeable furniture specialists. Maximum Gun Length: 44 1/2"